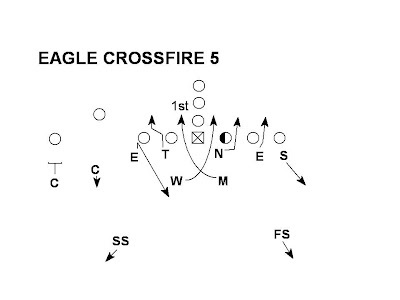 This post will cover the Sooner's Crossfire blitz. Crossfire can be run from the Eagle front (Under) or from Field (front set to the field). The front is also a G with the Nose aligned in a 2i on the guard. Crossfire is an interior X blitz by the Mike and Will. 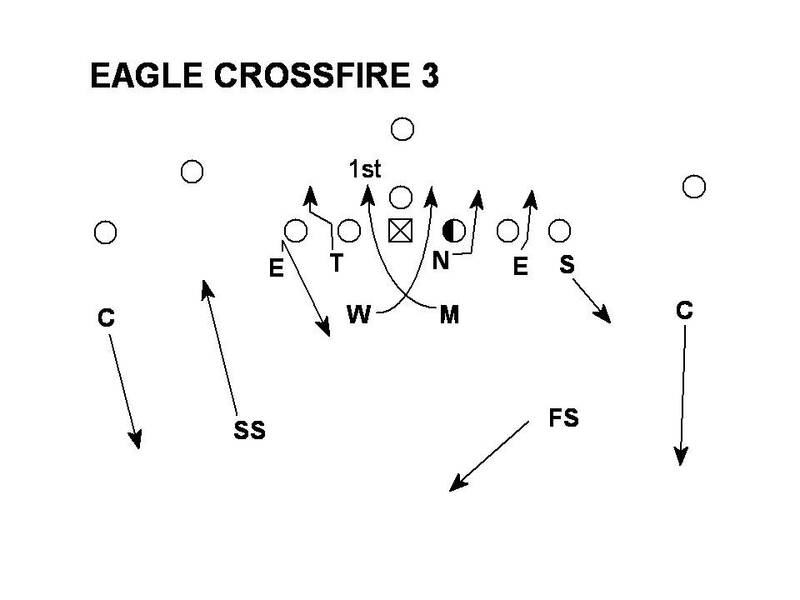 When the front is Eagle the Sam is aligned to the TE. 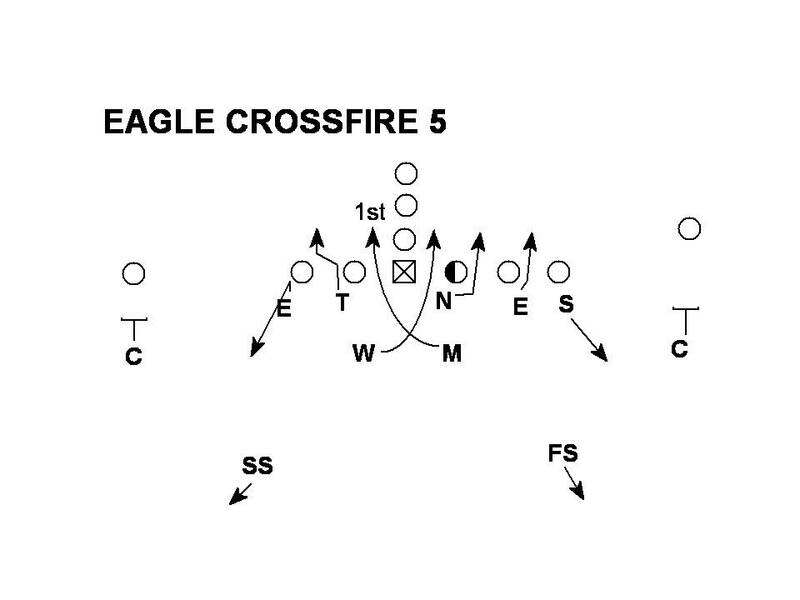 Versus a twins formation with the backside closed the Sooners will utilize a corners over to prevent the end from dropping off of a split #2 receiver. The Corner who comes over is the seam dropper to the twins side and the End takes the 3RH drop. 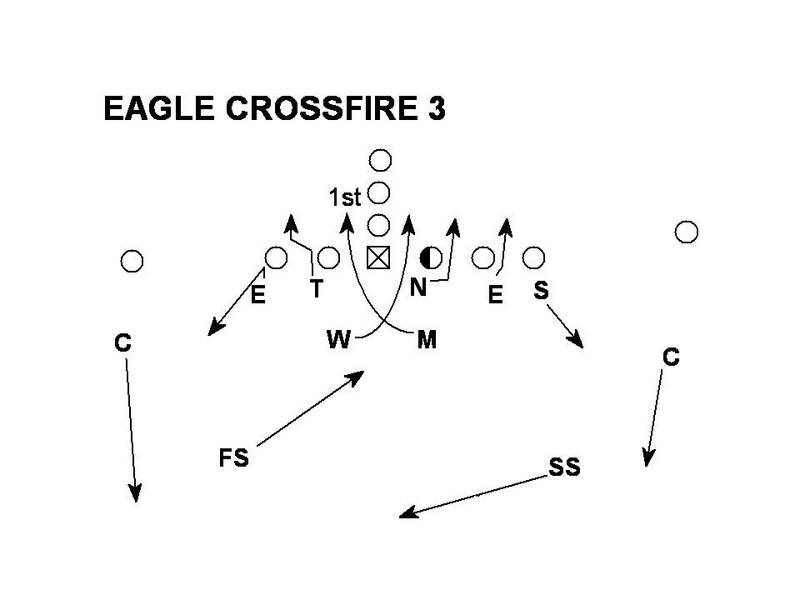 Against a 2x2 formation the Safeties will make the adjustments. The SS will take the seam drop and the end will take the 3 drop. 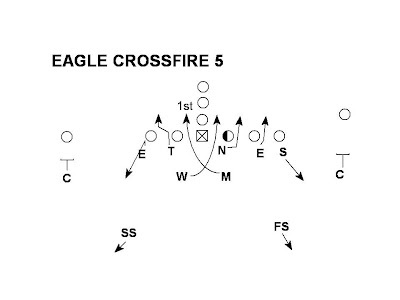 The Sooners will also run Cover 5 (4 under 2 deep) with Crossfire. The Corners play the flats and the Safeties are Deep 1/2 while the Sam and End drop the Hook-Curl. Vs. Twins the Corner will come over. The corner that comes over will take the Hook-Curl drop and the End will drop to the hole. 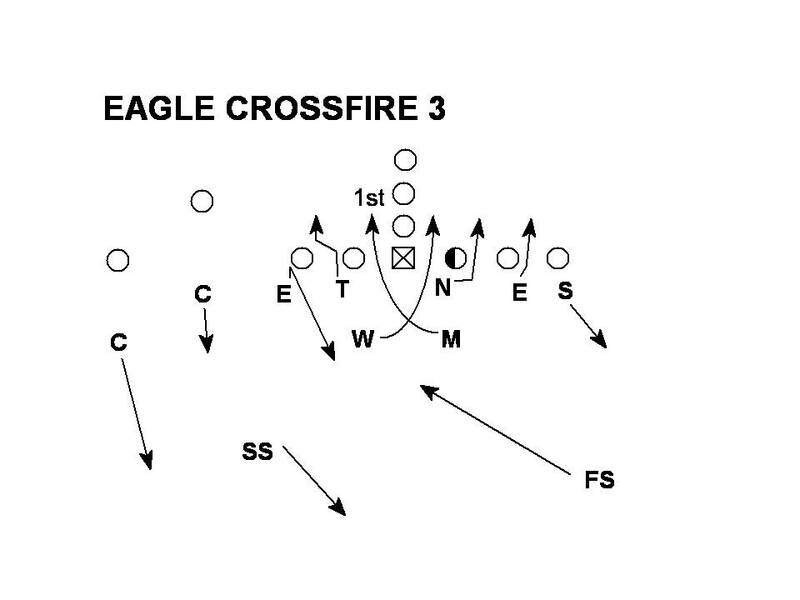 With a Crossfire 5 call the Sooners will check the coverage back to 3 vs. all One back sets. What I have noticed from studying this blitz, is that the Backer stacked behind the 1/2i technique usually goes first. 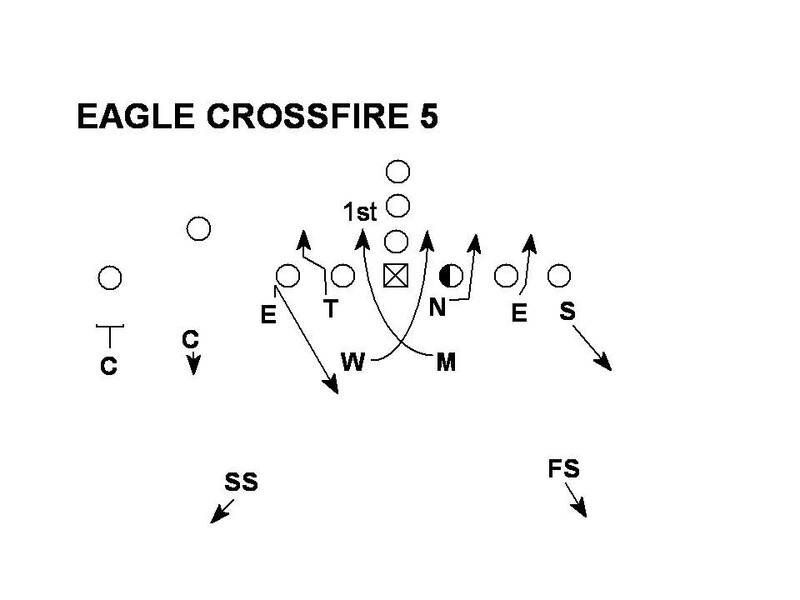 I think this is because the Center and Guard usually have that 1 tech to Stack Backer. 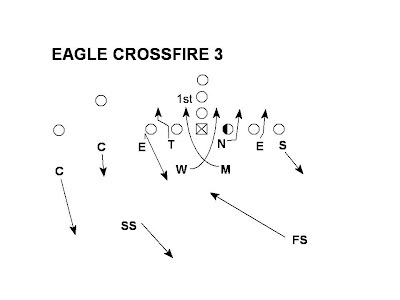 If the Stack behind the 1 goes first, it causes the Center to wheel back, which opens the hole for the second blitzer. This is just my guess, but I have seen the Under front teams have the Mike go 1st and the Over front teams have the Will go 1st.